Cut little notches, or slices around the edges; 4 cuts should do it. This keeps the slice from curling up when you cook it. It should look like this right before it hits the frying pan! Here in Jersey breakfast can consist of a cup of coffee and a buttered hard roll, but real Jersey Boys and Jersey Girls know what a “Triple Bypass Sandwich,” is– Taylor Ham, Egg and Cheese on a Hard Roll. Taylor Ham and Trenton Pork Roll are low carb so they’re Atkins, South Beach, and any low-carb diet friendly. Try a new way to prepare an old favorite today. 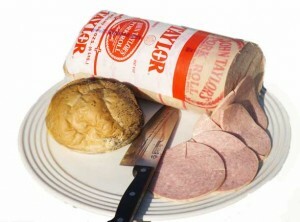 Taylor Pork Roll makes a fine breakfast, lunch, snack, or dinner! Thoroughly mix eggs, heavy cream, cream cheese, Ricotta, butter, salt and pepper in a food processor until smooth. Add finely chopped green onions and blend quickly. Spray a quiche baking dish with oil and pour mixture in. Sprinkle the Taylor Ham evenly on the top and then add the grated cheese over the top. Bake for 50 minutes or until the center springs back to the touch or a knife comes out clean. 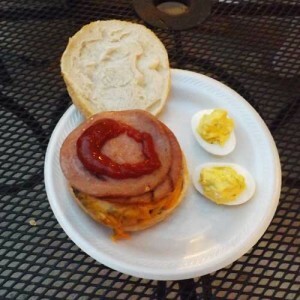 Most people don’t think of pork roll as a picnic item, but it can be. Grill it.. well done, or just warm, as you like it. Add condiments of your choice. Lettuce, tomatoes, onions, ketchup, etc. Place above ingredients in layersBrown on one side, flip and brown other site until cheese is completely melted. Press lightly with a spatula while cooking. 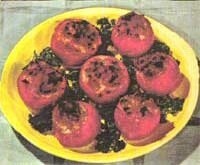 Try this recipe as an open faced sandwich with olives, onions, or any other pizza topping. Grill the Taylor Ham and the bacon. Add cheese to the Taylor Ham. Add the mayo, honey mustard, and tomato to a toasted sub roll. Add the meat and cheese to the roll. Top it off with lettuce, salt and pepper to taste. 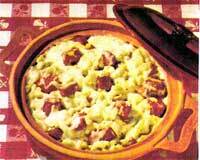 Pre-cook pasta, pre-cook cream sauce, add pork roll and toss all together in a baking dish. Bake at 350 degrees for around 30 minutes. Many people have written in asking about a product called Tastystrips. Apparently they were once made by the same manufacturer as Taylor Ham or Taylor Pork Roll is, and they were a snack food item. 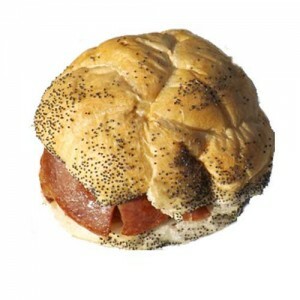 Cut pork roll in rectangular strips instead of circles. No need for a hard roll or any bread product – just add your favorite dipping ingredient, ketchup, mustard, or anything else you like, and serve. The Walla, Walla, Washington Way! add scrambled eggs and toast. “Not too spicy and certainly less salty than others” prepared this way.